In “Curve Components – Part 1” I introduced 8 elements (E1-E8) that go into a plan curve’s construction. In this post I’ll add elements 9 and 10 and go on to discuss how it comes together. 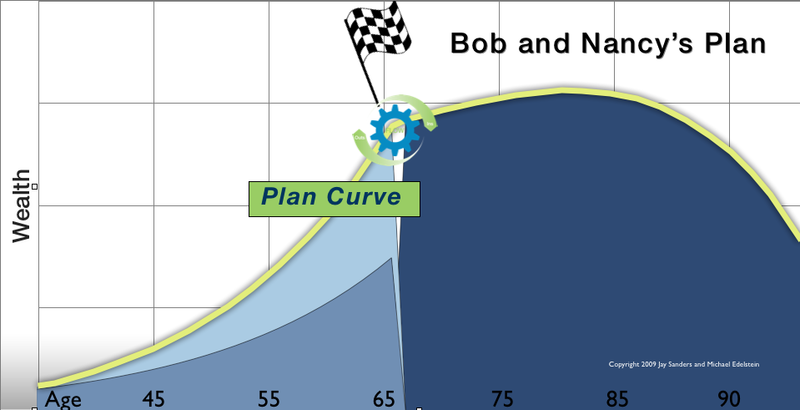 We left off in “Curve Components – Part 1” with Bob and Nancy’s assumption about expected social security benefits in retirement (E8). They continue with their assumptions by telling me they expect investment returns will be after tax 8% (E9) pre-retirement and 7% (E10) while in retirement. With E10 their inputs for their plan curve are complete. I enter the inputs into a spreadsheet which generates their curve. Let’s review the results of the calculations. The vertical axis tracks dollars, saved or needed, while the horizontal axis tracks years. The yellow curve line is the actual plan, the “Target Stat“. You’ll note three shades of blue under the curve; light, medium and dark. The medium blue shade represents the expected growth of current retirement savings. In our example that’s Bob and Nancy current retirement plan assets (E6) and what they’re expected to grow to at retirement (E1) if they earn on average an 8% (E9) after tax rate of return. The light blue shade represents the additional money they’ll have to save and what it is expected to grow to by retirement date (E1). This is a pure calculation based on the above inputs. The dark blue shade represents retirement or the draw down phase, which begins at plan year 25 (E1 or age 65 for Bob and Nancy) and tracks for 30 years (E4 or age 95 for Bob and Nancy). Flow is where they are relative to the “Curve” at any measurement date. In Part 3 I’ll be describing the forces that are beyond our control but impact the curve.